2018 has become one very notable year, ranging from Trump’s Presidency to North and South Korea’s disputes. Perhaps one of the biggest topics in the United States this year is gun control. The call for gun control has been an issue that’s existed for almost two decades since the Columbine High School Shooting in 1999. The most recent school shooting in Florida has brought gun control up for debate, once again. It’s no surprise that when a shooting occurs, the most immediate action taken should be to GET OUT OF THERE but is that really the best thing to do? The following instructions are here to help those unsure of what to do during such a situation. Prepare: It is more important now than ever to be prepared for a possible school shooting. CNN recently released an article, “There has been, on average, 1 school shooting every week this year”, stating that there have been 14 school shootings in the first nine weeks of this year. That estimates to about 1.5 school shootings every week. If this does not cause for concern then there is nothing to stop another one from happening. It is best to talk to your parents and your schools to figure out a plan in case one should occur. Even now schools prepare for the worst by doing drills in case of a shooting, as well as simulations of what to do when you see the shooter. This is the first step we all must take. Don’t Panic: We’re all told not to panic during a shooting, but that all changes when we hear gun fire from a rifle 12 meters away. The fear starts to kick in, the fear of death, of getting shot, of dying so young, and it has a way to make you lose sight of the here and now. We have to learn to take control of that fear in order to think of what to do next. Hide: When we hear gun fire, it’s best to hide and stay put. It is unlikely that a shooter will spend his or her time looking around in every possible hiding spot knowing that police could arrive at any moment. If you are in a room, lock the door and barricade it with whatever you can. Turn off the lights and stay clear of all windows so that the shooter is unable to see you. In fact this method was used in the Florida high school shooting by a 14 year old boy named Austin Dean. In the article “Teen survived shooting at Florida high school. Unbelievably, his mother survived a mass shooting last year”, published by the The Washington Post, it says “Annika Dean survived last year’s mass shooting at the Fort Lauderdale-Hollywood airport by hiding behind a luggage cart. Her 14-year-old son Austin survived this week’s shooting at a Parkland, Fla., high school by hiding in a classroom.” It has been proven to be an effective method of survival. Run: Now this would probably be the first thing that comes to mind when we hear a gun shooting, but that would result in absolute havoc? It’s better to wait until there is a safe path to an exit, meaning there is no gunfire near by. When you first run to an exit, run straight forward do not look back and do not attempt to save any material possession like backpacks or phones as the only thing they will be doing is slowing you down. 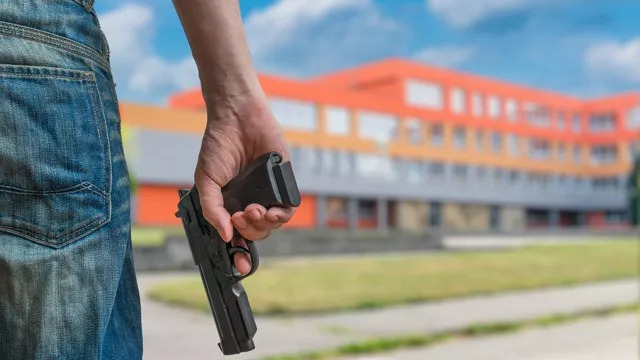 It is best once you are clear of the school to run with your hands in the air because this will make the officers on the other side aware that you are no threat but a victim. There is no need to worry about school shootings at the moment as it will only serve to bring people more stress and fear into one’s life. That doesn’t mean we all can not be prepared for the possibility of one. The world is becoming a more dangerous place and it will be a long time before any real change is made. It is best to keep aware of your surrounding and of these tips as they may one day serve to keep you alive.